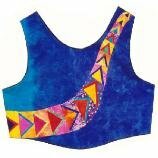 The Caribbean Pop Top is a figure-flattering vest alternative with curved hemline and a stunning splash of foundation-pieced color. Make it in a day--it's easy! Wear it over a shirt. With a slippery lining, the vest drops over your head and dips just below the waist at front and back. Includes sizes 8-18.